Indian officials say they have proposed an oil-for-drugs barter plan with cash-strapped Venezuela to recoup millions of dollars in payments owed to some of India's largest pharmaceutical companies. Several of India's generics producers, led by the country's second-largest player Dr Reddy's Laboratories Ltd , bet heavily on Venezuela as they sought emerging market alternatives to slower-growing economies such as the United States. Click Here for Detail. 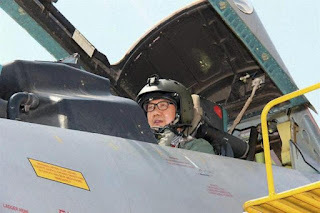 Union minister Kiren Rijiju on Wednesday flew a Sukhoi-30 MKI aircraft, joining an elite club of VIPs who have taken the frontline fighter jet for a raid . Clad in a jump suit and special eye-gear, 44-year-old Rijiju, took off from Indian Air Force’s Halwara base in Punjab and flew around for about 30 minutes in the supersonic jet, which can reach 56,800 feet and fly at a maximum speed of 2,100 km per hour. Click Here for Details. A week after the BJP lost its shot at power in Uttarakhand, its core group met today at the party's Ashoka Road headquarters to discuss the future course of action in Uttarakhand amid the changed political scenario. With the nine rebel MLAs formally joining BJP after the Uttarakhand fiasco, there is major dissatisfaction in the party's state unit. A week after the BJP lost its shot at power in Uttarakhand, its core group met today at the party's Ashoka Road headquarters to discuss the future course of action in Uttarakhand amid the changed political scenario. The group comprised the state president, organisation secretary, five MPs and BJP president Amit Shah. Click Here for Details. Sadhvi Pragya Singh Thakur, who last week got a clean chit in the 2008 Malegaon blast case, today broke her two-day-long hunger strike by drinking a glass of juice offered by a child at Vande Mataram Ashram of Vishwa Hindu Parishad in Ujjain. She called off her fast as the authorities made the arrangements for her to visit the ongoing Kumbh Mela. Sadhvi had gone on a hunger strike at the government-run Pandit Khushilal Sharma Ayurvedic Hospital in Bhopal as the authorities earlier did not allow her to take part in the Kumbh Mela despite a Dewas court's order. Click Here for Details. When Amina Ali Nkeki was kidnapped by the Nigerian terrorist group Boko Haram more than two years ago, she was was a mere schoolgirl. On Tuesday night, she apparently wandered out of a forest, asking for help -- accompanied now by a "husband" and a baby. She is the first of the more than 200 Chibok schoolgirls kidnapped by Boko Haram to be freed after the two years in captivity, Nigerian military officials and a witness say. Click Here for Details. Sri Lanka floods: Nearly 40 killed, 200 feared buried in rains, landslides. Over 200 people were on Wednesday feared buried in massive landslides in Sri Lanka following three days of torrential rains that have triggered landslips and floods, killing nearly 40 people, with rescuers running against time to find survivors under mounds of mud. Over 200 people were on Wednesday feared buried in massive landslides in Sri Lanka following three days of torrential rains that have triggered landslips and floods, killing nearly 40 people, with rescuers running against time to find survivors under mounds of mud. Click Here for Details. The Saudis, who deny responsibility for the 2001 attacks, strongly object to the bill. They had said they might sell up to $750 billion in US securities and other American assets in retaliation if it became law. The US Senate passed legislation on Tuesday that would allow families of September 11 victims to sue Saudi Arabia's government for damages, setting up a potential showdown with the White House, which has threatened a veto. The Saudis, who deny responsibility for the 2001 attacks, strongly object to the bill. They had said they might sell up to $750 billion in US securities and other American assets in retaliation if it became law. Click Here for Details.